Poach chicken with the first set of ingredients, simmer until tender, cool in the stock. Put all the dry dressing ingredients in a mortar and pestle and bash until smooth. Add rest of dressing ingredients to make a smooth dressing. Check seasoning. Shred chicken, add dressing, combine and serve. Garnish with coriander leaves. 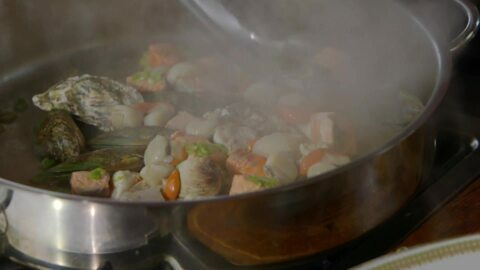 Today, Anne prepares Coconut Prawn and Crayfish Curry, Tuatua with Black Beans, Basil Soup and Clams, Oysters Natural and Cloudy Bay Clams with Grilled Hapuka.